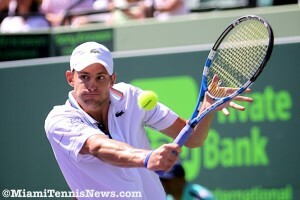 Andy Roddick is scheduled to play in the 2012 International Tennis Championships in Delray Beach, Florida. Roddick’s appearance will be highly anticipated after he was forced to withdraw last year due to flu-like symptoms. Ivan Lendl will highlight the Champions Tour event where he will complete along side Mats Wilander, Pat Cash, Michael Pernfors, Aaron Kricstein and Jimmy Arias. Delray Beach, FL – 2003 US Open champion Andy Roddick will headline the ATP World Tour event while tennis Hall of Famer Ivan Lendl will lead the eight-player ATP Champions Tour event at the 20th annual Delray Beach International Tennis Championships next February. 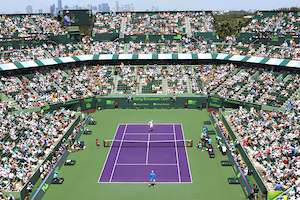 The combined ATP tennis event, played at the Delray Beach Stadium & Tennis Center, has been moved back one week on the ATP calendar to February 24 – March 4. 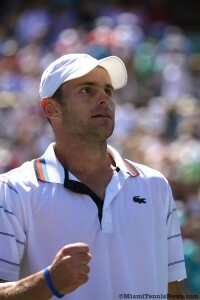 Roddick has been the most successful American over the last decade and enjoyed a five-year run in the Top 5. The 28-year-old former Boca Raton resident has reached the finals of five Grand Slams and in 2003 became the youngest American ever to be ranked No. 1 at the age of 21. Lendl, the eight-time Grand Slam champion who has lived in Florida for more than a decade, will headline an eight-player ATP Champions field that also includes fellow Grand Slam champions Mats Wilander and Pat Cash. The Czech-turned US citizen was the world’s No. 1 player for 270 weeks during his career, and he was the year-end No. 1 four times (1985-87, 1989). He played in eight consecutive US Open finals, winning the event three straight years from 1985 to 1987, and compiled an amazing 144 tournament wins. Joining Lendl, Wilander and Cash in the ATP Champions event will be 1986 French Open finalist Michael Pernfors of Vero Beach, Boca Raton’s Aaron Krickstein, the youngest ever ATP Top 10 player at age 17, and Jimmy Arias, No. 6 in the world as a 19-year old in 1983. Wilander, Cash and Krickstein have played in the ATP Champions Tour event since its inception in 2009 and Pernfors and Arias played last February. Roddick has played in four Delray Beach ITC ATP World Tour events and last played in 2003. He was the top seed in last year’s draw, but a bout with the flu put on hold his return to the tournament where he played his first professional match. The tournament is kicking off its third annual “US Open Ticket Promotion,” offering discounts on Delray Beach ITC tickets for the 18-session, 10-day event. Beginning Sunday, August 28 at 8:00 am and ending Sunday, September 11 at midnight, a 10 percent discount will be offered on all individual box seats ($70 – $90 regular price) and Reserved Series packages ($220 – $540 regular price), while individual reserved seats ($40 – $60 regular price) will be discounted 15 percent. The most popular Reserved Series packages include the Diamond Series ($540 regular price, all 18 sessions); the Champions Series ($320 regular price, sessions 1-9), which combines all ATP Champions Tour matches and four ATP World Tour sessions; the World Tour Series($430, sessions 6-18), including All ATP World Tour matches plus two days of ATP Champions Tour matches (including the final); and the Weekender Series ($220 regular price, sessions 14-18), featuring ATP World Tour quarterfinals, semifinals and finals. All four packages will be discounted 10% during the promotional period. Following the promotion, tournament packages will remain on sale, but individual tickets will not be available to the public again until November 1. Fans can order online through www.YellowTennisBall.com or by calling 561-330-6000. All ticket opportunities, prices and amenities are explained in detail on the website. The list of competitors who have successfully prevailed their initial outing in the finals at a major is brief. Today, Tomas Berdych was hoping to add his name to that distinguished roll of honor. To do so, the Czech would have to overcome his biggest hurdle these two weeks, 2008 Wimbledon champion and world number one, Rafael Nadal. Nadal dispatched newcomer Berdych 6-3,7-5,6-4 to capture his second back to back French Open and Wimbledon trophies. With a total of eight majors, Nadal moves up to fifth in the record books besides Ivan Lendl, Jimmy Connors and Andre Agassi. Berdych’s track to the finals was dramatic. In the quarterfinals, the Czech defeated six time champion Roger Federer. Moreover, Berdych halted Federer’s seven straight Wimbledon final streak. Subsequently, in the semifinals, Berdych ousted Novak Djokovic, the world number 3, and became the first player from his nation since Lendl in 1987 to reach the finals at the All England Club. With injury barring him from the defense of his title last year, Nadal had his knees come into the picture the earlier rounds. But, in the quarterfinals and semifinals against Robin Soderling and Andy Murray respectively, Nadal had no issues. Thus, the Spaniard appeared fit to battle. Although Berdych and Nadal are the same age, their careers have had divergent paths. Nadal holds 40 titles and has a 8-2 mark in finals of majors. On the other hand, Berdych’s overall record in finals is 5-5. Berdych coolly carried the opening game at love while Nadal duplicated with four easy points. Later in the first set, with a forehand crosscourt winner, Berdych held at 15 to stay in front 3-2. However, after mildly pushing Nadal on serve, Berdych committed two quick unforced errors. 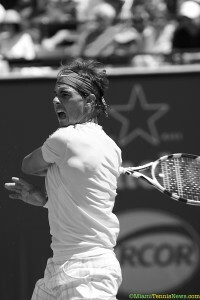 Then, with a forehand up the winner, Nadal arrived at triple break point. With Berdych unable to locate a first serve the entire game, Nadal punished another second serve with a backhand crosscourt shot leading to another miscue by Berdych and the break. Previously, Berdych had surrendered only two points on his serve. Promptly with a forehand crosscourt winner, Nadal consolidated at love for 5-3. After Berdych misfired on another forehand resulting in double break point, Nadal teed off on an abysmal second serve to get the error and claim the first set. Still, in the second set, Berdych had his chances. With two double faults and Nadal’s forehand floundering, Berdych had three opportunities to break in the first game. With Berdych failing to capitalize on second serves, Nadal maintained serve. Despite being denied, Berdych held with a love game. Although Nadal committed a few uncharacteristic mistakes, he never allowed Berdych back in. With Nadal ahead 4-3, at 40-30, Berdych connected on a backhand volley winner to level the set. After readily keeping pace with comfortable games, Berdych produced a rash of errors as he served to send the set to a tiebreaker. As a result, Nadal had triple break point. In a mirror image of the first set, with a forehand error by Berdych, Nadal broke to take a two set advantage. Incredibly, an entire year had gone by since Roger Federer and Rafael Nadal clashed in a final. At the Mutua Madrilena Madrid Open, these two rectified that by battling for yet another Masters 1000 shield. Nadal, the 2009 finalist, vanquished Federer, the defending champion, 6-4, 7-6 to claim an unprecedented 18th Masters shield surpassing Andre Agassi and a historic third straight Masters trophy. Since prevailing at the Australian Open, Federer has been in a slump with early exits in Indian Wells, Miami and Rome. The top seed in Estoril last week, Federer was stopped in the semifinals by the defending champion Albert Montanes. Conversely, this season, Nadal has been again the “it guy” on clay with titles in Rome and Monte-Carlo. By avenging his loss to Ernests Gulbis in Rome and beating David Ferrer, the hottest player on clay besides Nadal, in the semifinals, Federer seemed to be finding his form. Still, Nadal would be the most intricate puzzle to solve. Following a love opening game, with a forehand up the line error by Nadal, Federer had break point. But, by provoking mistakes from Roger, Rafael held for 1 all. Quickly, Nadal turned the tables and as a result of errors captured a break for 2-1. However, as a backhand crosscourt by Nadal sailed long, Federer had triple break point. Roger converted when Rafael’s forehand missed its mark. With the players at 3 all, three successive miscues by Federer gave Nadal triple break point. An unreturnable serve and two forehand winners allowed Federer to get to deuce. Yet, after Federer failed to capitalize on a game point, Nadal connected on a backhand crosscourt pass for a winner and his fifth break chance. When Federer netted the backhand, Nadal took a 4-3 lead. Then, despite resistance from Federer, Nadal consolidated for 5-3. Subsequent to a love hold, Federer hit a couple of great forehands and with a Nadal double fault obtained double break point. Promptly, with back to back errors by his rival, Nadal got to deuce. Still, Federer manufactured two more break points, But, with the return finding the bottom of the net on the next point, Federer could not get over the hump. Finally, with a forehand crosscourt pass for a winner, Nadal punctuated the first set. After Federer flubbed a volley on game point, Nadal went on to break to start the second set. However, by baiting Nadal into a few mistakes, Federer arrived at double break point. With a backhand crosscourt winner, Federer leveled the set. Then, at 2 all, leading 40-15, Federer found himself at deuce. By passing Federer two consecutive times, Nadal broke for 3-2. After Nadal consolidated with an easy hold, Federer had a love service game to maintain a one game difference. Taking the dropshot out of his arsenal for the first time, Federer fabricated triple break point. When Nadal misfired with the forehand, the set was equalized at 4. Then, with back to back aces, Federer crept ahead 5-4. As neither guy was able to gain a break point, the decider was the tiebreaker. Until the match is played, regardless of the statistics, there is no certainty as to the victor. However, in this case, the numbers did not lie. Today, in the Sony Ericsson Open final, Andy Roddick, the favorite on paper, improved his record to 6-2 versus Tomas Berdych. Roddick defeated Berdych 7-5, 6-4 for his second ATP Masters 1000 title in Miami and his 29th career trophy. Twice this season, these two have battled with Roddick taking both matches in straight sets. Yet, the manner in which Berdych moved on to the finals, with wins over Roger Federer, Fernando Verdasco and Robin Soderling, the Czech appeared to have at least an outside chance. With a forehand crosscourt winner, Berdych held at love his initial game. Then, with a backhand volley winner, Berdych put Roddick in 0-30 predicament. By coming with 130 mph heat, Roddick managed to hold for 1 all. Later, Roddick faced another 0-30 situation when Berdych connected on a backhand crosscourt pass for a winner. Despite not finding first serves, Roddick elicited enough return errors on his second serve to get to 3 all. Next, as the set progressed, Roddick found the groove on Berdych’s serve. When Berdych botched a makeable forehand up the line, Roddick had his first break point of the day. Although Berdych wiped that one away, later, he double faulted giving Roddick another opportunity. The American took it when Berdych’s forehand landed wide. Subsequently, at 40-0, with an ace, Roddick wrapped up the set. In the second set, with a backhand pass for winner, Roddick earned break point. Again with an unforced forehand error, Roddick seized a 1-0 edge. Despite letting a 40-15 game reach deuce because of double fault, Roddick still consolidated 2-0. Following two easy occasions on serve, when Roddick missed an uncomplicated forehand to get to 30 all, Berdych seemed to have a slim opening. Yet, with a backhand down the line pass, Roddick arrived at game point and with an ace had a 4-2 lead. After Roddick readily got to 5-3, with a deep return, he caused a forehand blunder from Berdych for his first match point. In the longest rally of the day, 31 strokes, Berdych terminated the point with an overhead winner. Later, Berdych saved another match point and finally held for 4-5. However, for the Czech it was delaying the inevitable. Roddick had permitted no break point the entire day and he had no plan to be generous although it was Easter. With an overhead winner, Roddick had double championship point. When Berdych netted a down the line backhand, Roddick wrote his name on the trophy. Q. Seemed [that] your first serve was off? BERDYCH: . . . my serve was not that good. But still, . . . I just lost two close sets. . . He [got] one chance and he just took it. That’s how it is . . . maybe I would get one then it would be different. Q. It seems . . .on the first break chance that he had in the first set, . . . you made an error on the first serve and then the clap from the crowd. Was that a distraction for you? BERDYCH: No, that’s usual, especially here . . . when you play in States against American, that’s all right. That’s how it is. Berdych’s ranking rises from 20 to 16 while Roddick moves up one spot to number 7. Roddick earned his 5th Masters shield with this win. In addition, Roddick becomes only the fifth multiple winner of this title keeping company with Andre Agassi, holder of 6, Pete Sampras with 3, Ferderer and Lendl each with two. All in all not a bad consolation prize.